There seems to be something about water and London’s canal systems that attracts creative people. After having his showroom and restaurant in West London, overlooking the canal between Harrow Road and Ladbroke Grove, Tom Dixon has moved to a brand new home. 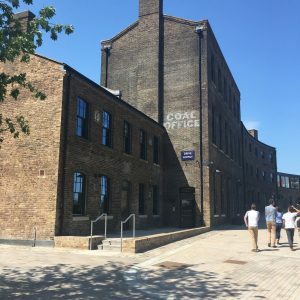 I was invited by Clippings to visit his new showroom at the Coal Office, between Regent’s Canal and Granary Square, part of the newly regenerated King’s Cross. This beautiful old building seems perfect for the next chapter in the designer’s career. 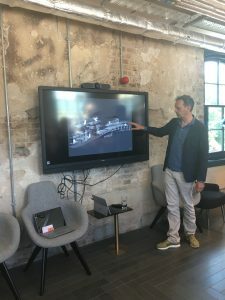 Tom Dixon himself gave a personal introduction at the beginning of the tour in which he explained how he was moving away from big commercial events and venues. He wants to explore how to keep in touch with his client base and production in a more personal way. Instead of investing in big marketing schemes, he would like to travel more, talk to people from all over the world and work with them, as that is, he says, what brings him a creative spark and new ideas. He talked about plans to apply his creative approach to not just lighting and furniture but accessories, tableware, eating (his restaurant is opening soon on the new premises), and ultimately, living. He also highlighted the need to pay attention to crafts; how and where something is produced. This is something that resonates a lot with me (see my previous post about a holistic approach to design). It can be summed up as a move from large scale, commercial, and corporate to a more human scale in general, where people and their experience are the main focus, as opposed to profit. From farmers who are offering their products directly to the end users rather than supermarkets, to Google talking about a more human side of technology and trying to convince us that AI is not in fact scary (Google I/O 2018 presentation); there is a palpable shift in the way we want to live, use and consume everything from things to services. It appears it is becoming increasingly clear to all of us now that technology has not only a good influence on our lives, but a bad one too. We’ve lost privacy, individuality, unique qualities of hand made product and personal contact between a client and a craftsman. However much technological advances make our life easier, this doesn’t always make us happy. At the same time, a personal touch, human interaction, and the exchange of skills and ideas do make us happy even when hard work and long hours are involved in the process. 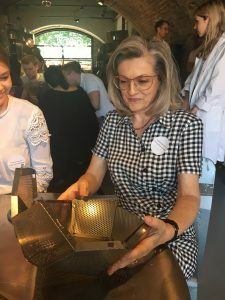 On the day, I had a chance to take part in a workshop where several groups were working on putting together Tom Dixon’s Etch Light. It was great fun working together as a team and I truly enjoyed every minute of it. I look forward to hearing more about Tom Dixon’s future events and I can’t wait to visit the new restaurant.